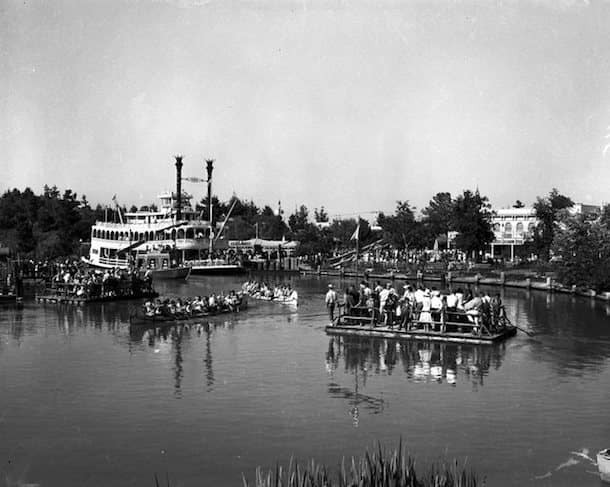 Over the past few weeks, we’ve been sharing stories about the original Disneyland park attractions that our guests have loved for more than 60 years. 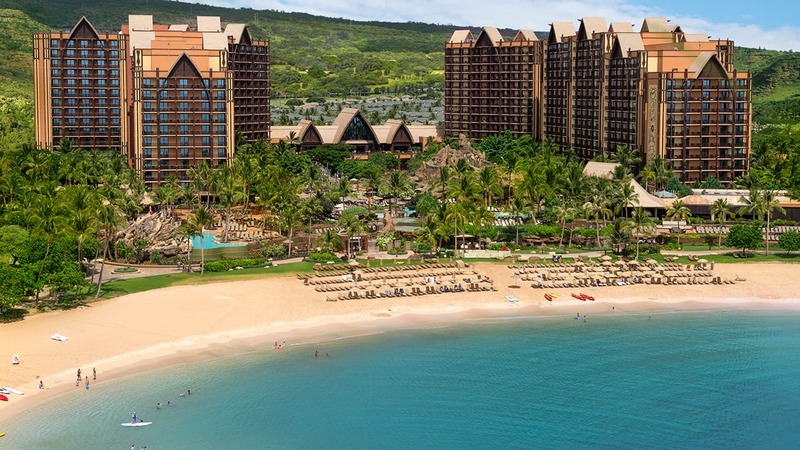 With all of the great memories we’ve been recalling, it seems the perfect time to reveal some exciting news about some of these classic attractions. Today, I’m pleased to tell you that the Disneyland Railroad and Rivers of America will reopen summer 2017 at Disneyland park. why not do soft re-openings before new years this year? why can’t Fantasmic and the mark twain riverboat return this holiday season instead of next summer? We are going the first week of May 2017, will the Disneyland Railroad be open? I’m not sure if that would be “summer”. About time. I went this past June and hated seeing the river all dammed up. The only change that should happen to Fantasmic must be the return of a certain sea witch from the deep. Ursula should definitely float on the water again. Other than that, no “upgrades” if you please. And that goes for Primeval World too. Thanks for the update, Erin! I wonder if the have considered adding actual seating for Fantasmic! during this renovation!! I can’t wait to see how it turns out, super excited! Hopefully they will add new features to the fantastic show! So stoked, Erin. Can’t wait to see this classic reopen. Count me in on opening day! I worked the Davy Crockett Explorer Canoes for a few years back in the early ’80’s. I am pleased to read they will be returning. And it was great to read the history of the Rivers of America. John. I’ll be so glad to have the Disneyland Railroad back open! I recently had back surgery and was counting on the railroad to get around. I was there earlier this month and had to rent a scooter instead. I hate those scooters! Will the walkway from Big Thunder to Fantasyland be open when these attractions return? We’ve missed riding the Disneyland Railroad during our visits to the park, so looking forward to hopping onboard next summer (especially if the Lilly Belle is available)! Oh, and finally getting our steamboat captain certificates from the Mark Twain, too! BEST NEWS OF THE DAY!!! A Fantasmic cast member told us at our last visit that it may not be returning and when the show died half way through I was heartbroken! I’m so glad my FAVORITE part of Disneyland will be returning! I was holding out hope they would decide to bring Mike Fink Keel boats back. One of my most missed rides. I hope it’s all open for the birthday trip I’m planning the first week in September. It will be a real thrill for my 70th birthday. This is the best Disney news I’ve heard in a long time! Our last trip to Disneyland, while it was awesome, just wasn’t the same since we weren’t able to ride the Disneyland Railroad and the Mark Twain. I’m really looking forward to visiting again after these attractions are back up and running! I sure hope Fantasmic! Is open during the D23 Expo next year!! That would be icing on my cake! 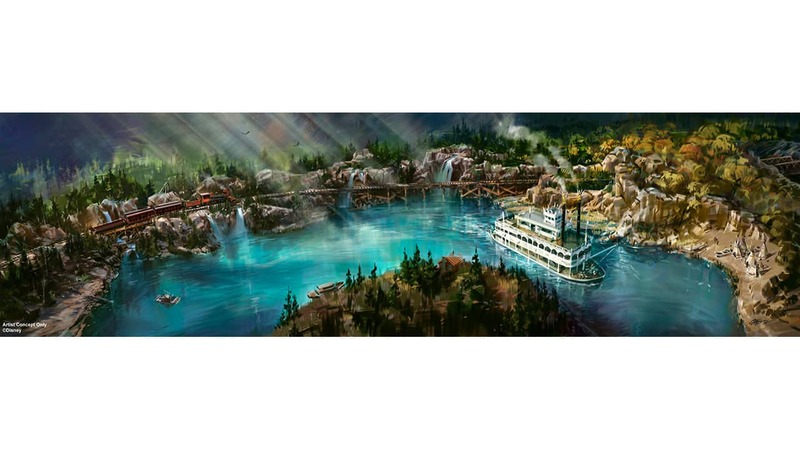 I heard the Rivers of America, and Railroad were going to reopen on April 2 2017. I have planned for this. I am making my first trip to Disneyland in 2017 (after 49 trips to Walt Disney World), and the wife and are planning for May 2017. We were going to go this year, but for me the Riverboat, and the Railroad are mandatory. Now I am hearing the SUMMER of 2017. What has happened to the April 02 date? If these two attractions will still be closed in May, I need to rethink my plans…. I’m really missing the railroad and the relaxing atmosphere around Hungry Bear and Big Thunder Ranch. I just let my annual pass expire. Maybe once the railroad is running again I might renew. Can’t wait to see this. I miss riding the train so much! That’s fantastic! Can’t wait to visit next July! 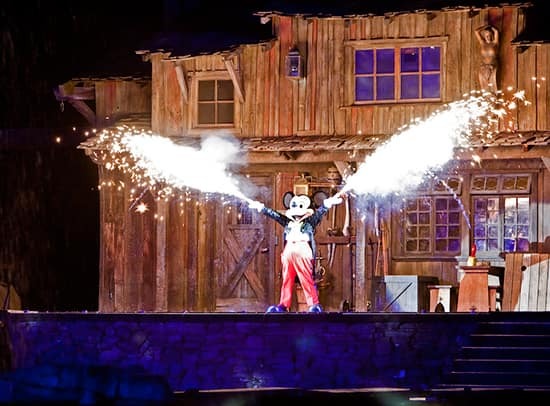 Going to Disneyland this summer…it will be weird without Fantasmic! Hi Erin! Good news indeed. 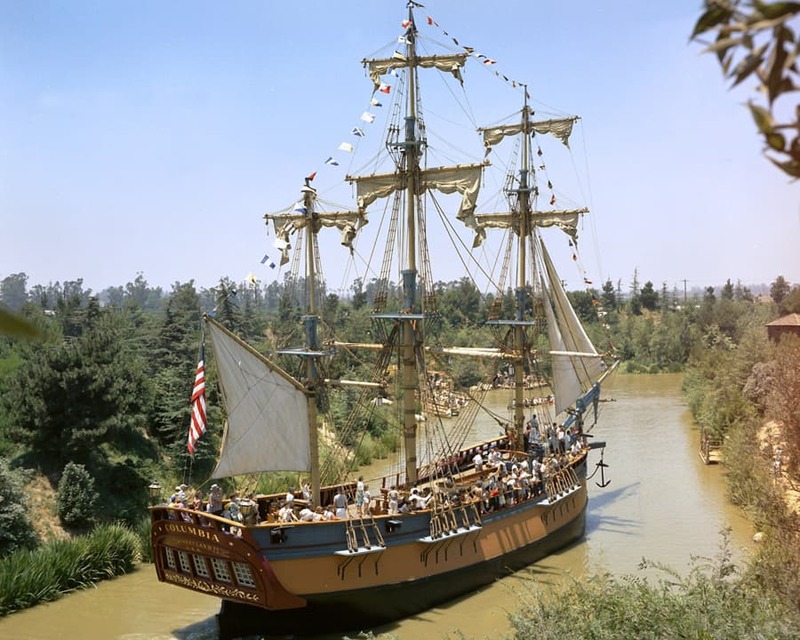 You are probably to young to remember that there were also Mike Fink keel boats that guests could ride on. Mike Fink Keel Boats used to be around a while as well. It really was a busy waterway. 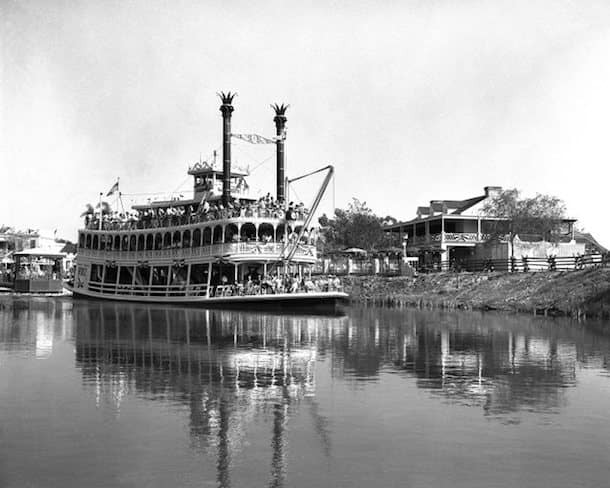 With the shorter river route, will the Mark Twain and Columbia “slow down” or “make stops” to make up for the loss time or will the attractions just indeed be shorter? Seems like 1/4 of the island/river has been truncated, yes? I’m so excited for everything to return! I sure missed a nice relaxing ride around the rivers during my trip last week! My BABY FANTASMIC! is coming back I sure hope on her 25th Birthday!!!!! Boy are we gonna CELEBRATE!!!!!!!!! Thank you Disneyland! BEST NEWS EVER!!!!!! !